Canada has a long and proud whisky-making tradition. So why, asks Davin de Kergommeaux, did its House of Commons Speaker choose a Speyside single malt as his ‘official’ whisky? When the Speaker of the British House of Commons selects an official parliamentary Scotch whisky, the report is typically buried deep inside the inner pages of the papers. Should the Speaker choose, for example, Aberlour 12 as his official Scotch, he simply joins the company of a large contingent of whisky aficionados who appreciate Aberlour 12. Its balance of rich, approachable flavours with subtle nuances make it a whisky lover’s favourite and an excellent ambassador for the country where it is made – Scotland. Canada’s links to the UK prevail, even though we outgrew the tradition of using the Union Flag’s colours on our own flag in 1965. Many other traditions were left behind too as Canada matured as a nation, asserting its independence from Mother England. So, when Canada’s Speaker named a Scotch whisky, rather than a domestic one, as Parliament’s official whisky recently, some Canadians were not favourably impressed. It never occurred to the first 33 Speakers of Canada’s House of Commons that the country even needed to identify an official parliamentary whisky. 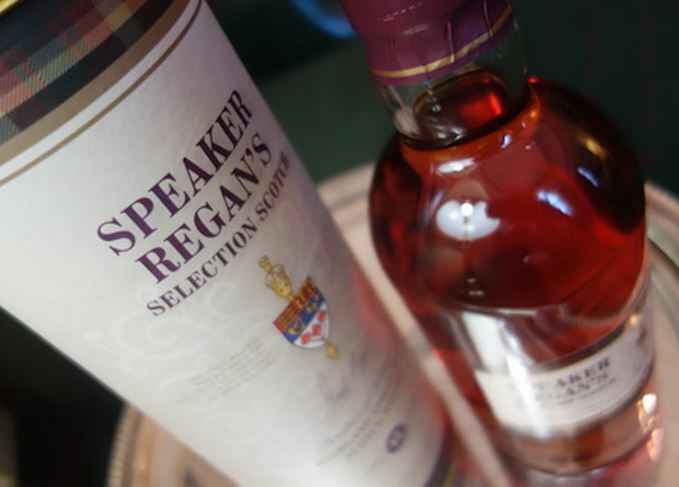 In 2003, the then Speaker, Peter Milliken, decided to adopt that British tradition and selected a Scotch single malt as Canada’s first ‘official’ parliamentary whisky. Earlier this year, citing this ‘tradition’, Geoff Regan, Canada’s 36th Speaker, convened a committee of MPs and Senators for a blind taste test to select his official parliamentary whisky. His officials insist the competition included several Canadian whiskies, even though the committee met to make their selection immediately after a Burns Night dinner – an event extolling all things Scottish. The predictable outcome? Canada’s whiskies were passed over and a foreign import, Aberlour 12, was appointed Canada’s official parliamentary whisky. Now packaged in a commemorative tin and labelled as Speaker Regan’s Selection, Aberlour 12 is poured at countless official functions and given to visiting dignitaries as a souvenir of their visit to Canada. Much has changed in the world of whisky since Speaker Milliken adopted that first Scotch 13 years ago. Canadian whisky has re-asserted itself among the world’s finest. It turns up regularly on connoisseurs’ bars, and people line up to sample it at whisky shows across North America. It also generates C$5.8bn in GDP annually and supports some 8,500 jobs in Canada. Many of these are on Canada’s farms, a segment our government has pledged to support. Naturally, Canada’s whisky makers are incensed at this missed opportunity to showcase the country’s fine whiskies. Instead, Canadian parliamentarians chose to tell the world that this country’s leaders prefer foreign whisky over Canada’s own. But why, Canadian distillers ask, were any foreign whiskies considered at all? And why was the selection process tied to an event that promotes Scottishness? True, Canada has a long and proud Scottish tradition, and Canadians expect their leaders to honour Canada’s cultural mosaic. One of our provinces is called Nova Scotia – New Scotland. Nevertheless, the Scotch Whisky Association (SWA) took umbrage when a distillery in that province had the temerity to use the word ‘Glen’ in the name of its single malt whisky. When it is made in Canada, the SWA argued, single malt is not Scotch. Similarly, here in Canada, Scotch is a foreign product that has no place as our parliament’s official whisky. ‘This is a huge slap in the face not only to Canadian distillers but also to the thousands of Canadian farmers who supply grain to make our whisky,’ said Jan Westcott, president and CEO of Spirits Canada, on behalf of Canada’s distillers. To most typical Canadians, though, the words ‘Scotch’ and ‘whisky’ are interchangeable. So it is conceivable that some of the Speaker’s selection committee members were somewhat vague on the difference. Now that this distinction has been drawn to their attention, perhaps we can hope that, when current supplies are exhausted, Canadian parliamentarians will choose a new Speaker’s selection from among the many award-winning whiskies produced in Canada – and by their constituents.